Rompers are all the rage this summer! They’re comfy and quick to put on, which is perfect for this new mommy! My biggest pet peeve though is when you get a romper that’s not lined at all and you can see everything underneath. That’s not the case with this gorgeous romper from Riffraff! I’m obsessed with the off-the-shoulder style, the colorful floral pattern and I love how it’s so casual and cute yet it can easily be dressed up for a whole different look. I added two delicate necklaces and a chunky bracelet to complete the look. 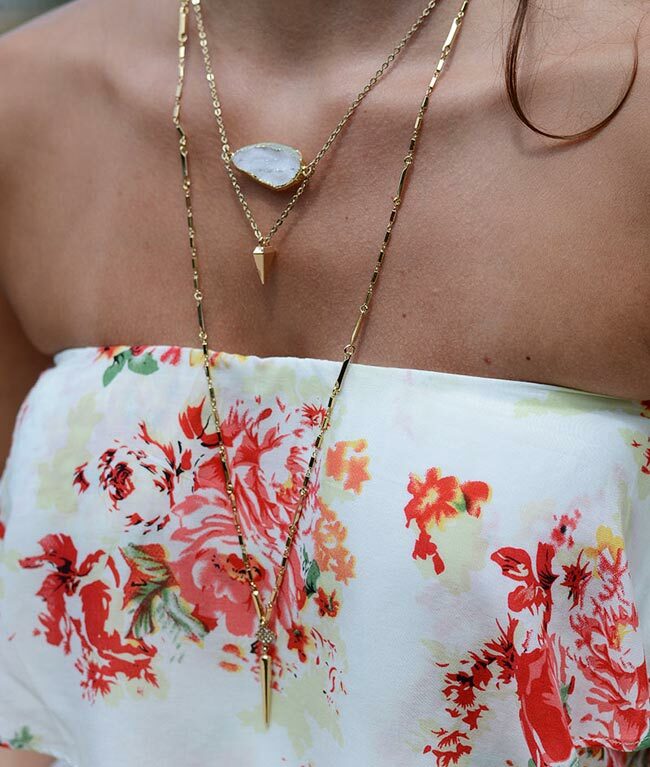 The short necklace is from local Charlotte boutique KK Bloom and the longer necklace, which is adjustable, is from Stella and Dot. You can add wedges or some cute sandals and you’re ready to head out the door in less than five minutes!